Ladies and gentlemen, it is time for another post in our PhoneArena Awards of 2011 series! Today, we are here to unveil the worst tablet of the year, and we believe that you will strongly agree with our choice once you see it. For more than a few tablets came out over the year's course, and while only a few of them were successful, most of the ones that did not were still decent devices that could keep one entertained for a while. The tablet that is about to walk away with the “prestigious” title, however, would likely fail to satisfy the requirements of even the most undemanding customers. But before we begin, allow us to remind you that we have given eleven other awards already. The categories are listed below, so do not hesitate taking a look in case if you have missed any of them. Without a doubt, the ViewSonic ViewPad 7e takes the top spot today as it is the most disappointing tablet we laid our hands on this year. Sure, it $200 price tag is reasonable, but when you take its real life performance into account, it becomes apparent that you are much better off getting the identically-priced Amazon Kindle Fire. The ViewPad 7e is thick, heavy, bland-looking, and uncomfortable to use, but the list of its flaws does not end here. Its 7-inch 800 by 600 display is of the resistive kind, which makes simple things like typing quite difficult. Sure, it has a pair of cameras, which is unusual for such cheap tablets, but the poor quality of their photos is the reason why you won't be using them much. So, if you are looking for a tablet, and $200 is all you can spend, stay away from this one. There once was a linux-based tablet with Intel hardware named JooJoo. It didn't sell well. However, the same company that made it, Fusion Garage, decided to take another shot at the tablet market with the Grid10. Priced at $300, the device is pretty decent in terms of hardware – dual-core Tegra 2 chip, 10.1-inch 1366 by 768 display, front-facing camera and 16 gigs of storage. You can even get a 3G model for an extra $100. However, an Android tablet this is not. Instead, it runs GridOS, which may be based on Google's platform, yet looks nothing like it. Its home screen is a huge, you guessed it, grid where you place the shortcuts for your apps. It runs some Android applications, but the Android Market is not supported, so alternative app stores is what you have to use instead. The software feels sluggish overall, and the battery life is pathetic by today's standards. And when it comes to software updates, you are at the small company's mercy. In a nutshell, the Fusion Garage Grid10 could have been a decent tablet if it wasn't for its unpolished platform. There you go, folks! The ViewSonic ViewPad 7e grabs today's “Worst tablet” award, followed by the Fusion Garage Grid10. 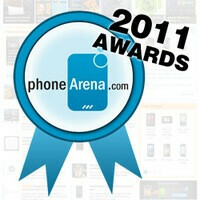 And while the PhoneArena Awards of 2011 are nearing their end, the most exciting categories are yet to come. We have another award to give on Monday, so stay tuned! I think the zoom deserves a mention. It was over priced and came out half baked. No let for 7 months, no flash and no ad card support when it launched. streak 7? terrible battery and screen? constant freeze, poor support? # 1.5 worst tab 2011? anyone? so what is the worst tablet that actually holds >.01% market share? i never heard of the tablets listed. i would vote streak 7 and blackberry playbook, maybe hp touchpad. Looks like that tablet was designed by Apple's lawyers. It has some aspects that they suggested.